Sunny days are finally here! 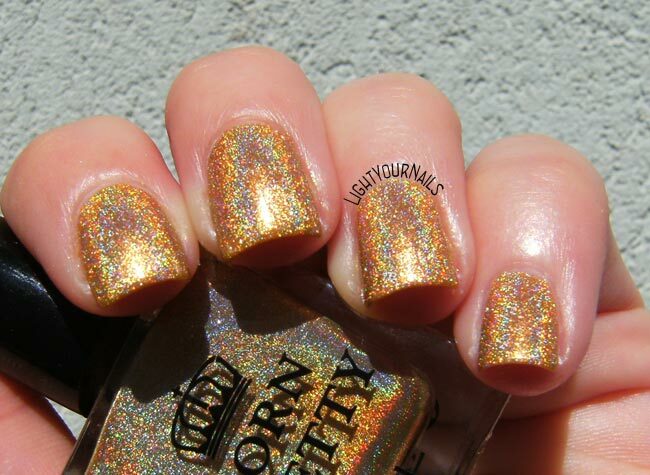 That means holo nails for me! Unfortunately I’m showing you a nail polish that is almost impossible to find nowadays, but maybe you can get something similar elsewhere. 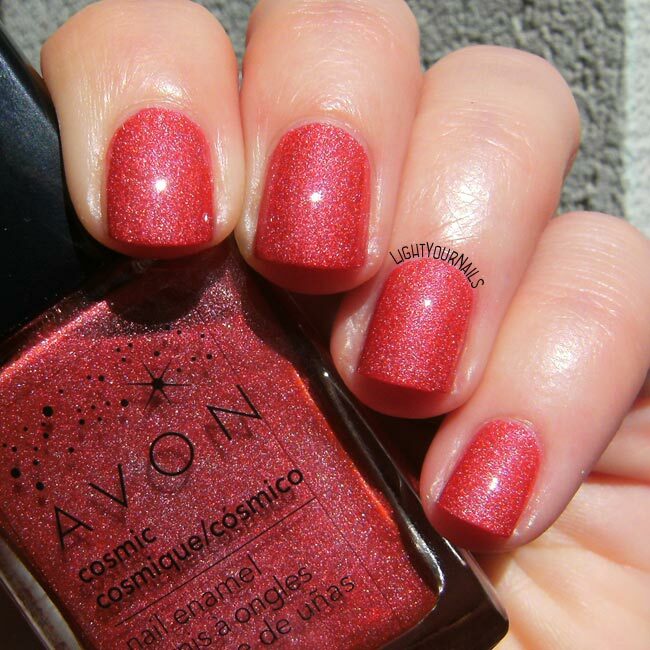 Avon Supernova was released in the United States several years ago as a part of the Cosmic collection that consisted of scattered holographic nail polishes. 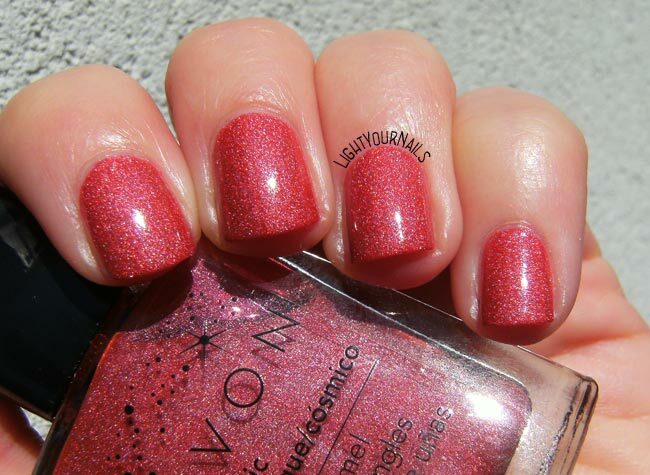 It’s a strawberry pink shade and it’s so easy and smooth to apply, plus it’s a one coater. It’s very pretty although I must admit my favourite from that collection was the yellow one. What do you think? 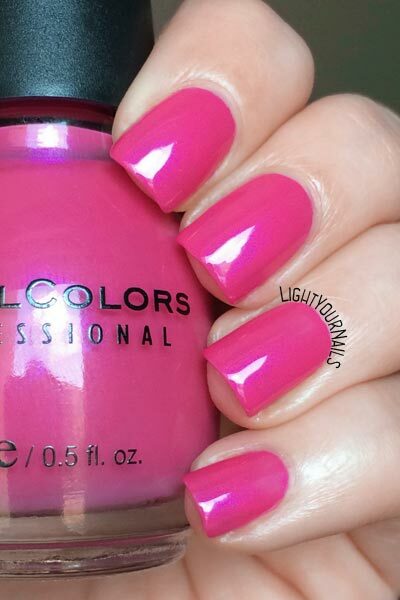 Are you waiting for the sunny season to wear bright nails, too? 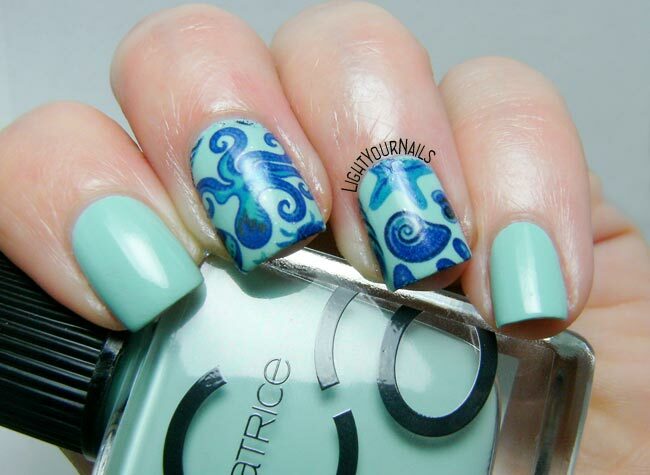 Today I have a blue zebra nail art to show you! I started with H&M Silver Fern as my base, and added some glittery turquoise from the tips to about half of the nail. 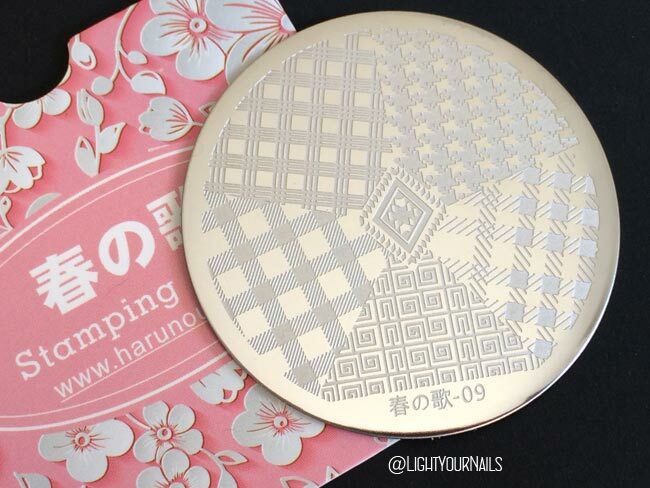 I let it dry shortly and stamped a geometric pattern from Bornpretty’s BPX-L020 “Geometry” stamping plate. The pattern is very big for my nails and ended up looking like a zebra as you can see. As usual I sealed my nail art with Essence XXXL Gel Look top coat. What do you think of my blue zebra nails? 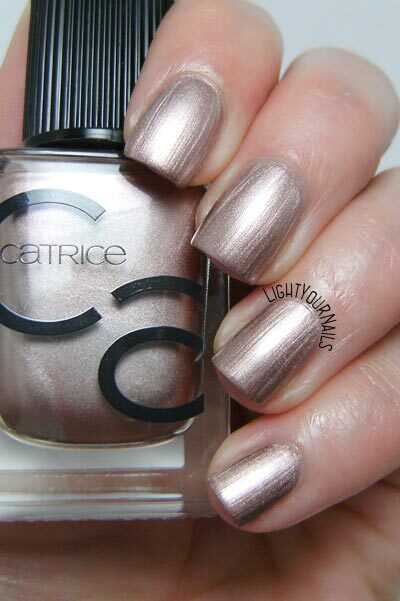 Have you noticed metallic and chrome nail polish is the new trend? I’ve never liked them but someone eventually does. They usually work great for stamping though. Kiko launched a new Pastel Metal collection, too. I wonder if it’s the previously called Mirrors in the new bottle. But let’s get back to today’s post. 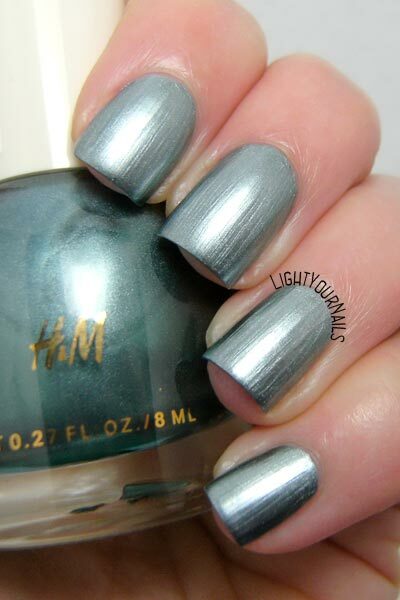 Following the trend I decided to wear H&M Silver Fern which is a silvery blue chrome nail polish. 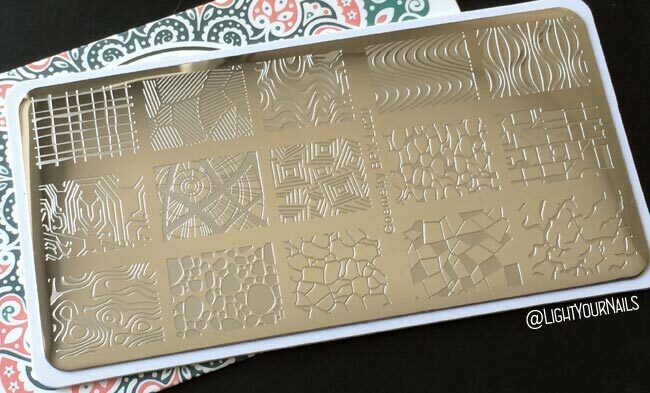 I purchased it for stamping when I found it on sale at 1€ but haven’t used it for that purpose yet. Today I’m wearing a full manicure with it. Application is very easy thanks for the rounded brush, but this kind of finish will show any flaw you have on your nail surface. Top coat is only needed for protection as it doesn’t change glossiness. 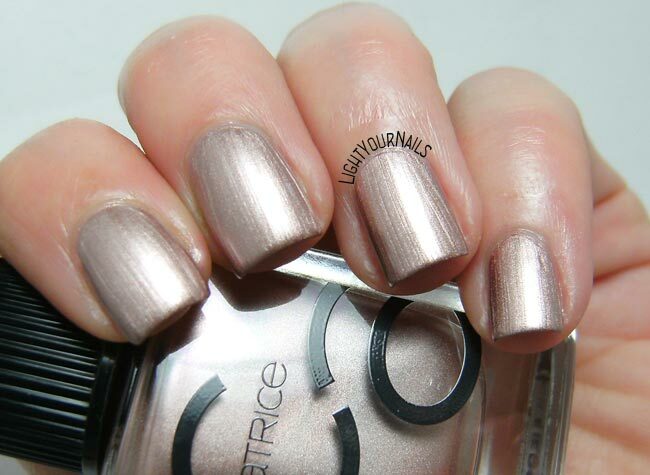 What are your feelings for chrome/metallic nail polish? Love or hate them? 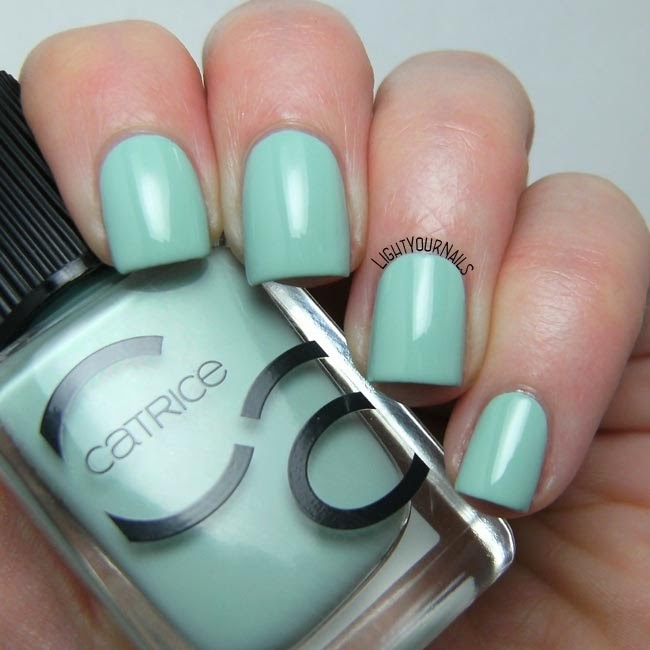 Today I’m showing you Cien Turquoise, that was released last week in Italy. It’s a limited edition sold at Lidl drugstores all over Europe. I tried to swatch it as fast as I could so you can decide if you want to go shopping at Lidl. But to be honest they were completely sold out yesterday at my nearby store. The whole Tropical Summer collection was a hit, the only product that was still on the shelves is the body butter, but I am pretty sure it was restocked because there were too many pieces still available. There were also a number of new different products this week. All of them are limited edition and available while stocks last. So if you are in Europe and would love some pieces you’d better hurry up. But let’s get to nail polish! 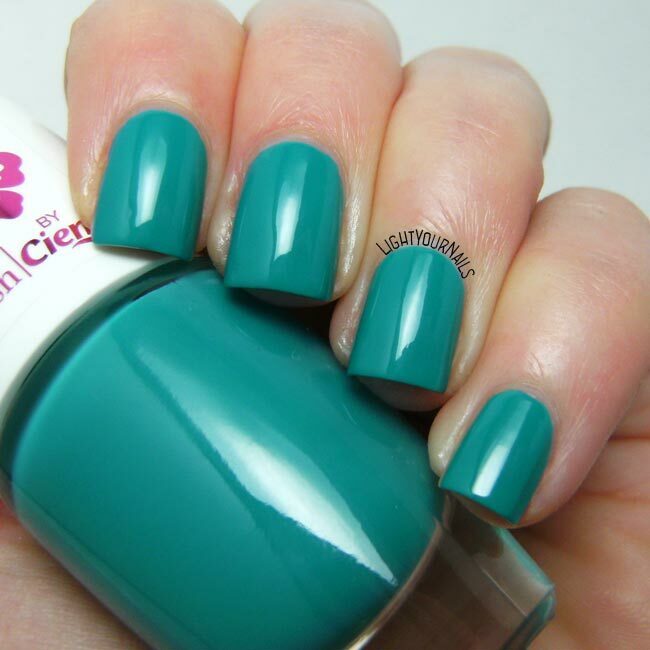 Cien Turquoise is a turquoise crème with an unusual formula. If you unload the brush as you’d normally do it will dry while polishing. So, you need to use thicker coats that will dry quick anyway. That’s not bad but I was kinda lost at first I must admit. It dries super glossy, too, and you can’t beat the 1,49€ price tag. Quite pretty, uh? You can see the photo of my haul below here. I posted it on Instagram that same day. I also purchased a spray-on body lotion yesterday which is not pictured. I couldn’t resist such an unusual product! Do you ever shop at Lidl? And maybe you got something from the Tropical Summer collection? Today I am reviewing something different than nail polish or nail art stuff. 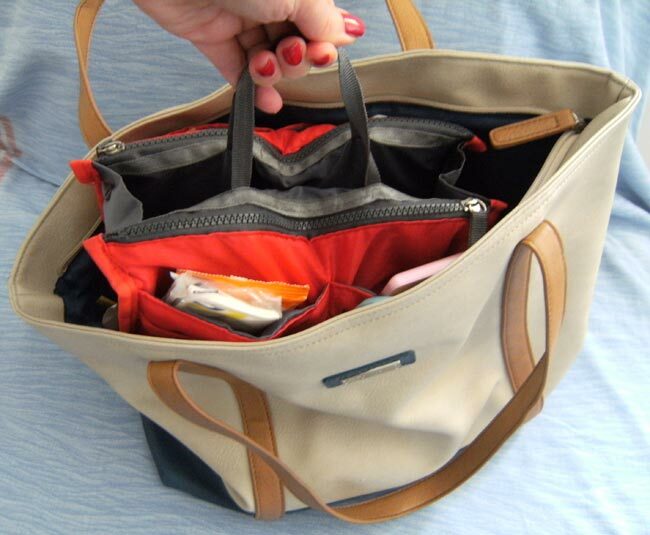 I will share with you a very useful item that totally made my life easier: a handbag organizer. I use big bags that I can fill with plenty of stuff, that also means when I need something I won’t find it unless I empty the bag. Does that happen to you, too? Last year I started looking for something to organize my bag so I could find what I was needing in a second. I finally found this item I am showing you today, which I loved so much that I got a second one a few months ago. 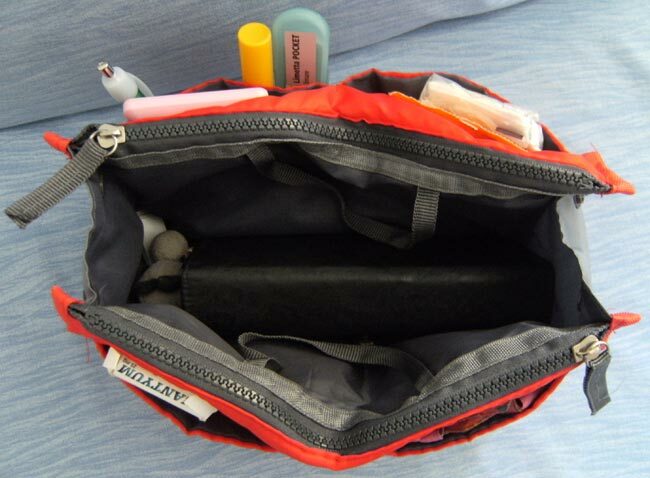 It’s an organizer made of polyester in size 28cm x 9cm (about 11in x3,5in). You can change the depth by closing the buttons at the sides or leaving them open instead. 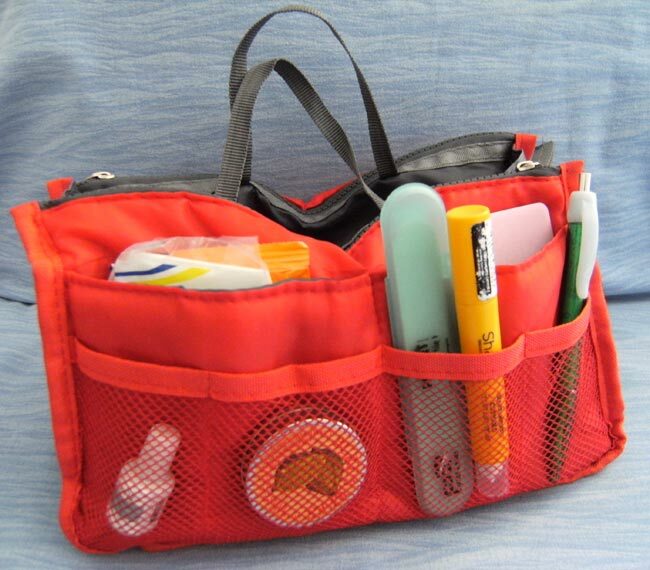 This organizer has plenty of pockets, a big open one in the center, two that can be closed by zippers at the sides and various smaller outer ones. It comes in different colours. I purchased a brown one at first, because it fit lots of my bags, then I was sent a red one by EnjoyOurs, an online webshop I already mentioned before. The red one is what I photographed today but they are the same. I just noticed the colours vary depending on the seasons. Right now there’s no brown available but there’s plenty of bright Spring shades such as blue, lilac, pink and a lovely pea green! 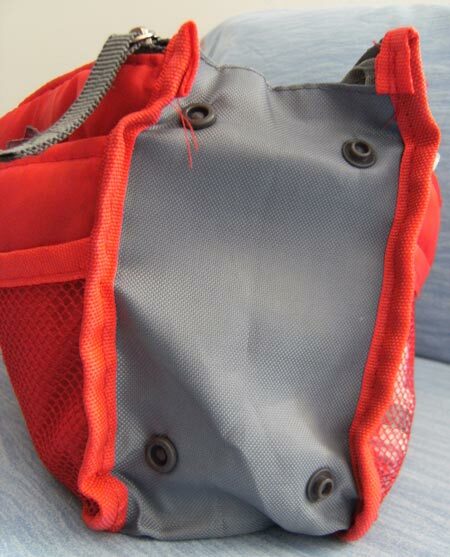 Other than filling it very neatly thanks to its pockets, I find it super handy that it has some small belts so you can just pull it out of one bag and put it in another one. That quick! 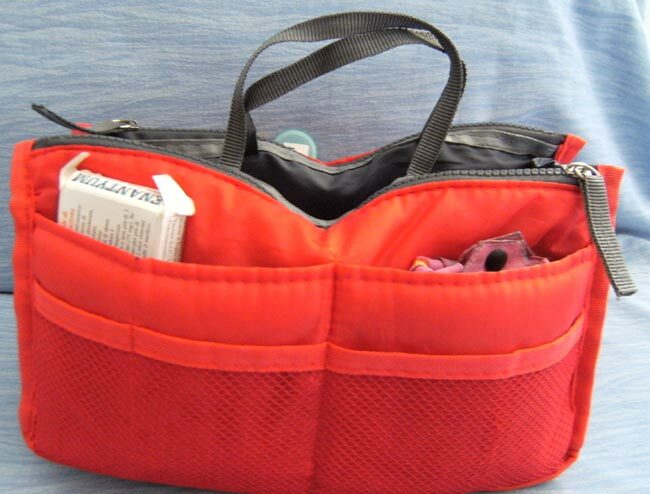 Seriously, I needed like 15 minutes to change my bags before I had these organizers! Is that me only? Now 2 minutes and I’m good to go. Photos explain it better than I can do, so here you get a few! As you can see I don’t close the buttons because I keep my wallet in the main pocket and it’s huge. This way it’s the first thing I find when I open my bag, same for my keys, which are in the same pocket. In the zipped side “A” I have lipstick and powder for mid-day touch-ups, while in side “B” I have a mirror, hand cream and lip balm. In the outer pockets I keep a side for nail related stuff mainly i.e. cuticle balms and oils and a nail file. Then wipes, tissues, a pen, phone charger etc. On the other side I have pain killers because I never know when migraines hit me, and a folding shopping bag. Then whatever I need I just put it in a random pocket. If you wanna have a look at this incredibly useful product, or anything else really, there are links underneath! And if you feel like shopping at EnjoyOurs you can use code SDT10 for 10% off. 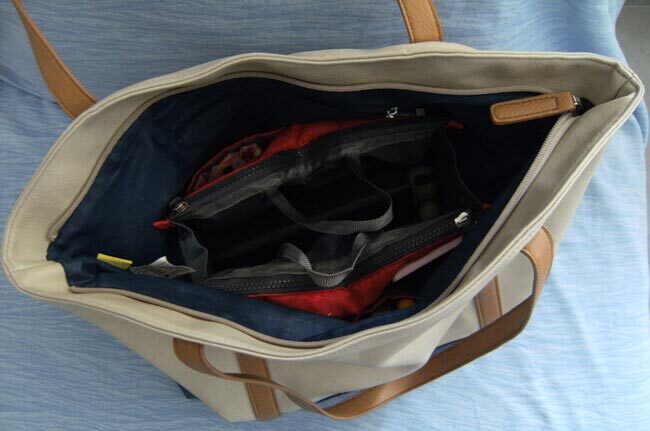 How do you keep your bag organized? Do you like big bags or purses? Funny enough, I was all about purses when I was younger. Now my wallet alone wouldn’t fit one of them! 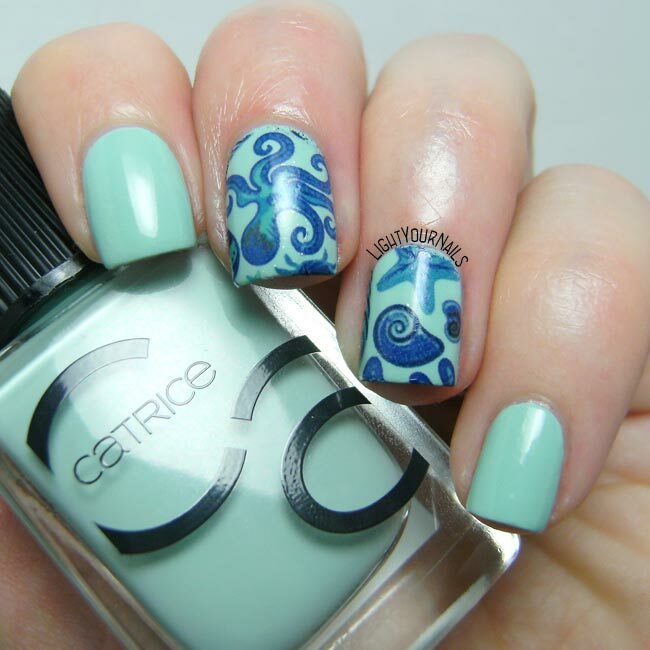 Today I am showing you a very simple nail art that I created with some water decals and Catrice ICONails Mint Map (no. 14) nail polish. Theme is nautical as you can see. 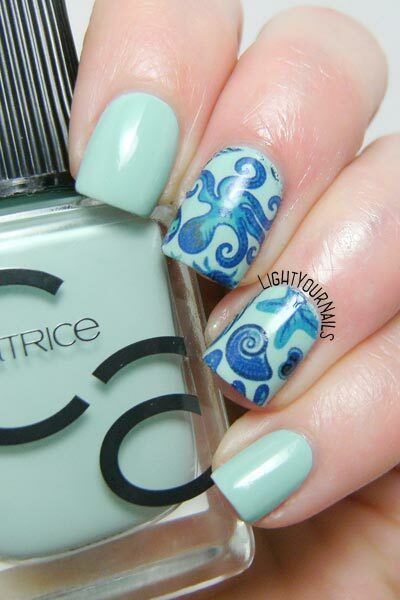 As I’ve said, this is a very easy to create mani. I put some decals from Bornprettystore in water and sticked them to my nails. Then I cleaned up the excess on my fingers with a q-tip dabbed in acetone. My issue with water decals is sticking them without creating ridges. I found out that patting with a sponge or blotting paper helps. I used some toilet paper and it actually worked! Photo is without top coat. I added Essence Gel Look XXXL afterwards. That one never smears my nail arts. 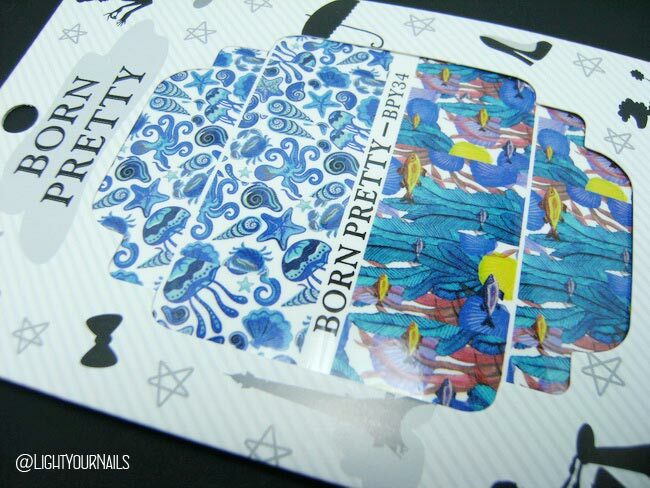 Thumbs up for these water decals by Bornpretty. They are only 99cent and oh so pretty! But then again, I have lived by the sea for my whole life so I am really weak when it comes to anything nautical or beach etc! 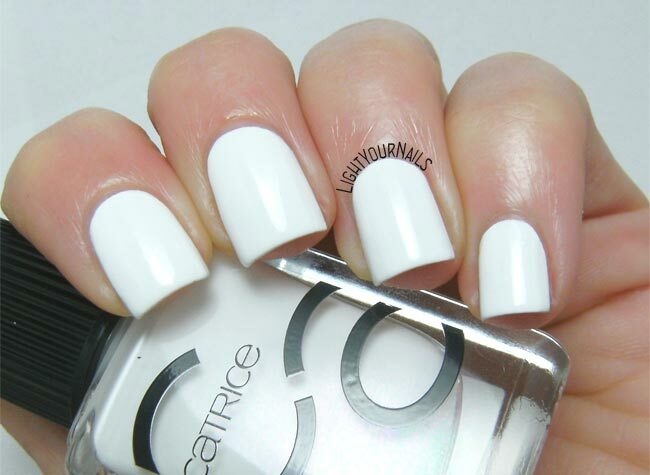 I hope you like today’s mani even if it is so simple! 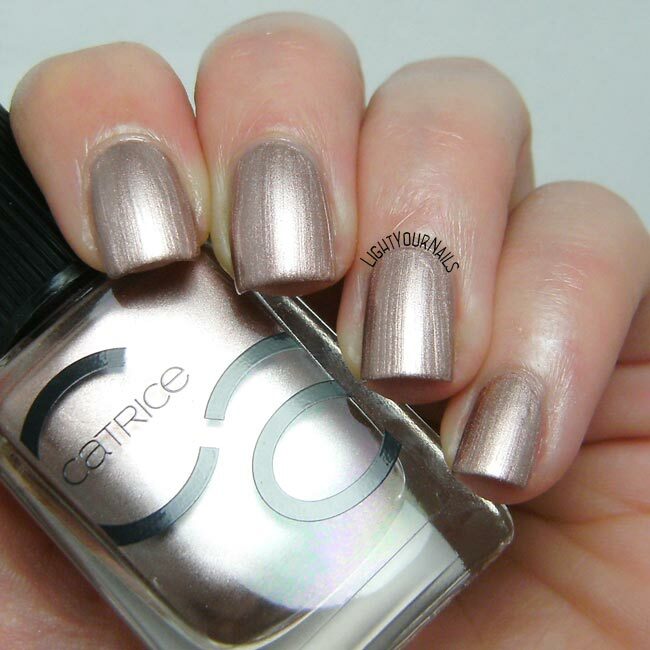 After showing you a preview of the new ICONails Gel Lacquer by Catrice Cosmetics I’m back with the first shade I wore: no. 14 Mint Map. 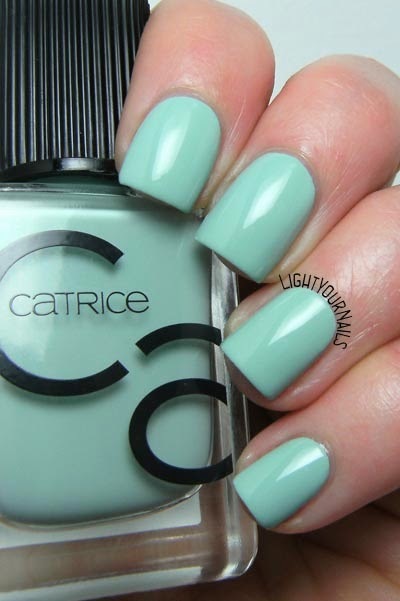 As the name says Catrice ICONails Mint Map is a pastel mint crème nail polish. Formula is on the thick side but workable, esp. keeping in mind it’s a pastel shade. Colour is opaque at first coat already, although I always prefer adding a second one to help with lasting time. 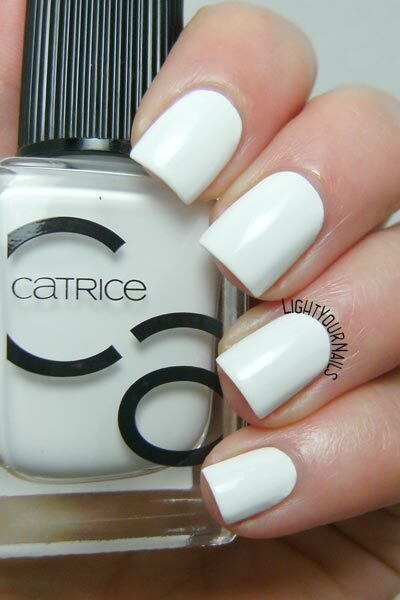 The rounded brush guarantees easy painting leaving the cuticles quite clean so you barely need any touch-up. 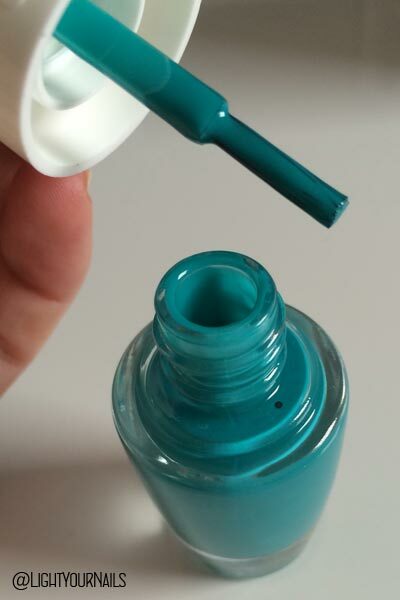 The cap is double and you can take the big one off and just use the small one for a better grip. 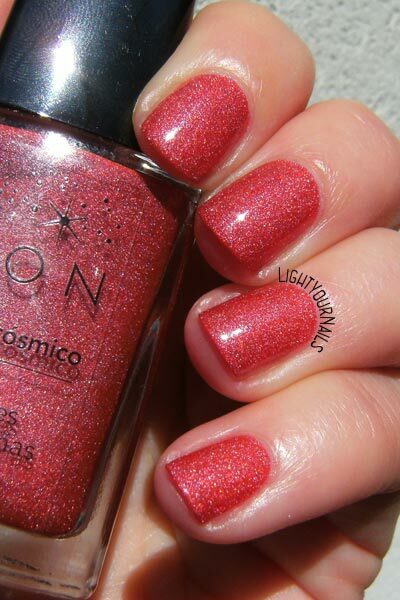 Photos: two coats + ICONails gel top coat. This new nail polish range should last up to 7 days. It chipped on me after less than two. But as I’ve said in my preview post the gel top coat is meant to cure under the sunlight, and it’s been raining for 10 days here. I need to test it the way it’s meant to be i.e. during a sunny day and check if it really helps lasing time. And anyway “Up to…” really means next to nothing. Know what I mean? Back to this nail polish itself, I find it quite pretty, easy to apply and very smooth and glossy. A very good pastel creme. What do you think of the shade? Are you looking forward to this range to pop up in stores? 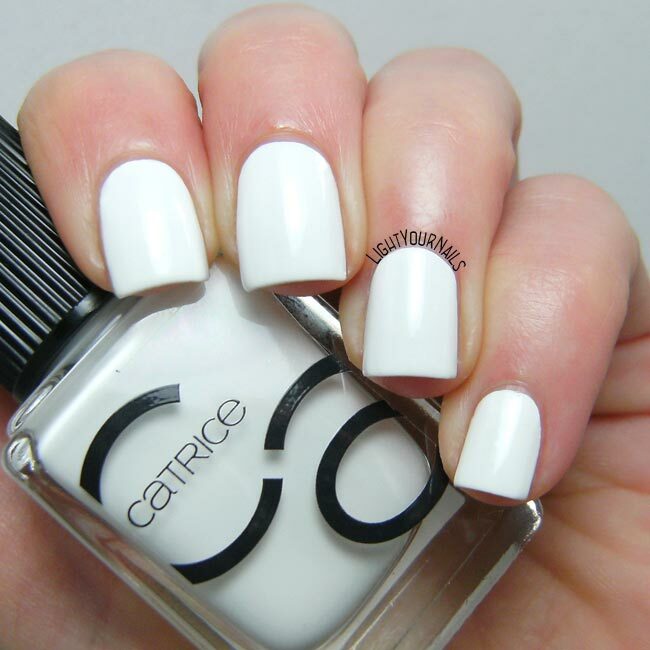 If you are following me on my socials, mainly Facebook and Instagram, you might know that while visiting the last Cosmoprof Italy I entered the #foundmyICON contest for a chance to win Catrice Cosmetics’ new ICONails nail polish range. A few days after Easter I was contacted by Catrice Cosmetics telling me I won a set. 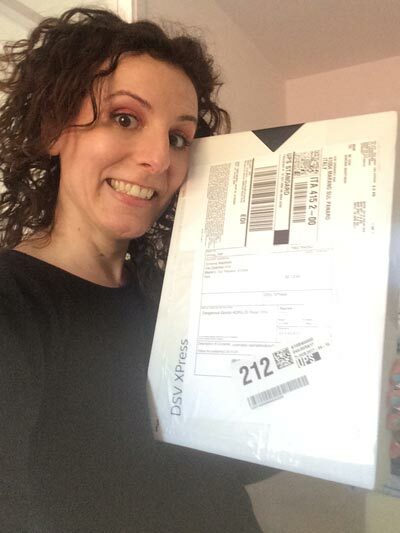 You can’t imagine my happiness when the package was delivered and I realized how heavy it was! I started jumping up and down and sending photos to everyone! 21 Want To Be My Brights-maid? I tested a couple shades this far but I couldn’t really make an opinion on this new nail polish range. 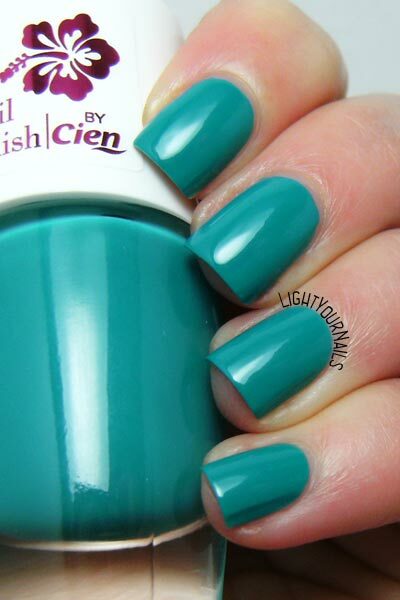 The gel top coat is one of those hybrids that need UV rays to cure, but no lamp. Unfortunately it’s been bad weather for at least 10 days now and I could never dry it under the sunlight and check what a difference it makes, if any. I will keep you updated. For sure I won’t be able to swatch all 45 colours in a timely manner so if you saw some bottles that you’d love to see first just ask for it below or on my socials and I’ll do my best! Anyway, I feel so spoiled right now. How lucky was I?